A 2-in-1 face and eye cream protects and repairs skin from damage caused by urban pollution. CITYLIFE not only sweeps away toxic micro particles but provides an ultra moisturizing facial experience. 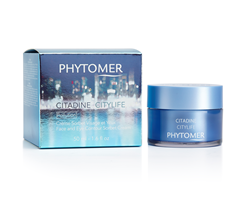 Expert in skin depollution for 20 years, Phytomer launches the newest product within the anti-pollution collection: CITYLIFE. Formulated in a refreshing sorbet texture and suitable for the eye contour, CITYLIFE re-oxygenates tired skin thanks to a powerful cocktail of marine ingredients. A combination of three marine sugars create active ingredient, CITYSAFE to depollute, cleanse and oxygenate the skin. CITYSAFE, along with blue and red algaes and Phytomer’s patented seawater concentrate, Oligomer® reset skin, repairing damage caused by pollution, signs of fatigue, dark spots and a dull complexion. CITYLIFE not only sweeps away toxic micro particles but provides an ultra moisturizing facial experience. The sorbet cream is enriched with phospholipids and oils to provide a light, fresh texture for all skin types. Directions for use: Apply morning and evening to clean skin. *Single application of CITYLIFE, exposure to micro particles, rinse then measurement of the amount of micro particles . **Measurement of the level of hydration by cornemetry on 12 volunteers, 15 minutes after single application. ***Self-scoring. Application twice-daily for 7 to 28 days on 24 women.